If you haven’t been to Bitrix24 marketplace yet, you should visit it how. It contains a number of applications that integrate other online services with Bitrix24 (Mailchimp for example), help you migrate your data from other CRM or project management platforms, or add features that Bitrix24 doesn’t come with (web forms, sticky notes and so on). These apps were developed by Bitrix24 partners and until recently this was a requirement in order to create an app. Now you can create your own private app, without getting a partner status first. Private app will only be available inside your own account. They don’t undergo moderation process and aren’t listed publically in the marketplace. API and all documentation necessary for developing an app are available here. 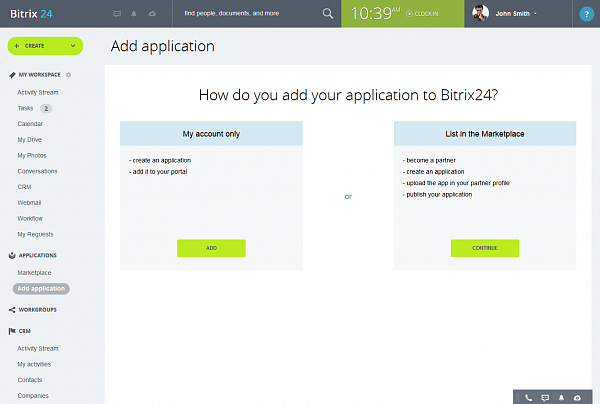 You can also hire Bitrix24 partner to develop an app for you. To add an app, simply go to Applications menu that's on your left hand side when you are logged in and click 'Add application'.